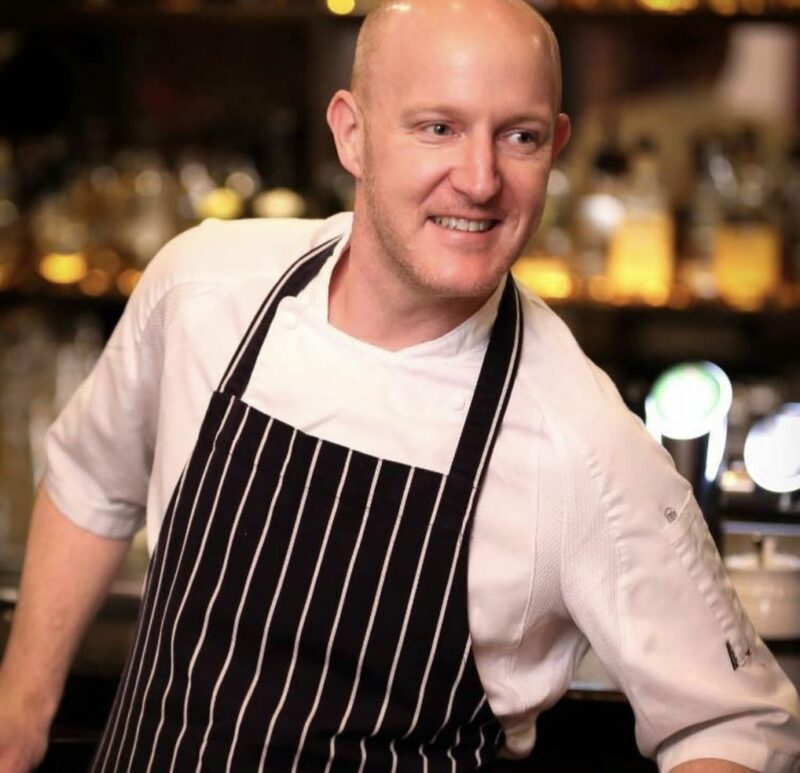 Delicious Dining, the South’s largest independently owned hospitality group, has appointed Andy Taylor-Rose as its Executive Chef. Taylor-Rose, who was recently awarded Hampshire Chef of the Year has been tasked to enhance and extend the group’s culinary offering and will be responsible for over 40 chefs at seven venues ranging from fine to casual dining. Taylor Rose explained that Southampton had recently experienced an influx of casual dining outlets which has impacted restaurants in the City. The 41-year-old, who had previously worked at the Café Royale under Herbert Berger and Rhinefield House New Forest among others before returning to Southampton to co-own The Brasserie which, under his ownership, was awarded the Restaurant of the Year 2017 at the British Restaurant Awards. Southampton’s Shrimp And Burger Shortlisted For The National Burger Awards! Southampton’s Shrimp and Burger bar and restaurant has been shortlisted for for prestigious National Burger Awards. The Bedford Place eatery competed against over 100 entries from around the country to be shortlisted, alongside nationally recognised restaurant brands, to the last 16 finalists. The restaurant’s chef, Liam Kelly, entered a recent addition to the restaurant’s menu The New Yorker; a handmade beef burger served topped with mouth-watering blend of American and Swiss Cheese, New York deli favourite pastrami, dill pickles and ham with homemade bacon jam, all placed on a spicy ‘slaw base and a sliced beef tomato and served on a lightly toasted Brioche Bun. Liam will be representing the Southampton eatery in February when he attends the finals in London. 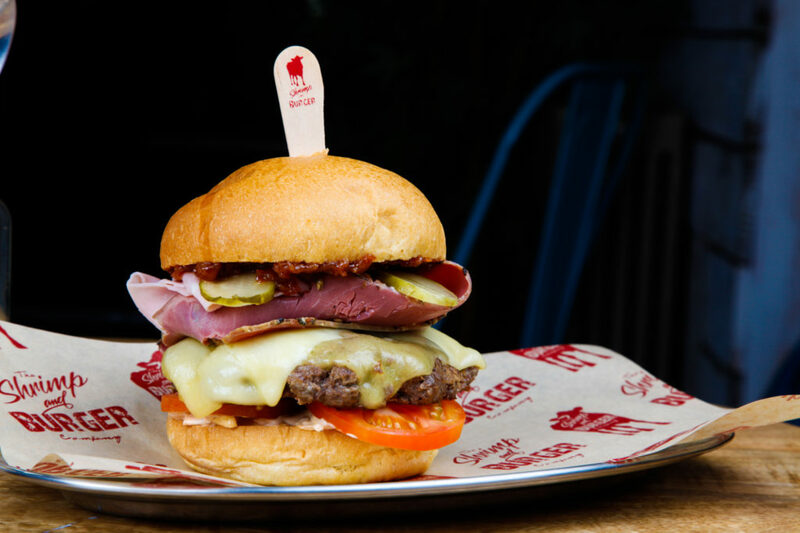 He will be serving up the New Yorker and also creating another burger from a selection of ingredients supplied by the competition’s organiser Casual Dining Magazine. It’s Official! The Grand Café is the Best Bar in Southampton! Delicious Dining’s Grand Café triumphed in the Best Bar None Awards when they were presented with the accolade for Best Bar category. Launched in Southampton in April, Best Bar None is a National scheme aimed at raising standards and rewarding licensed premises who demonstrate positive management practices. Grand Café staff were delighted when they scooped up one of the top three awards in recognition for their hard work. 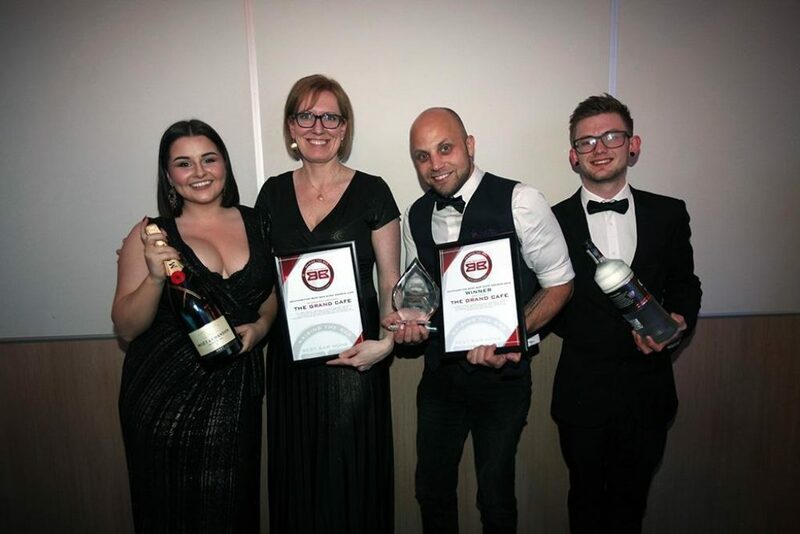 The award was presented at a Gala Dinner held to celebrate the city’s pubs and bars operating safe venues and promoting Southampton as a safe and vibrant nighttime destination. Delicious Dining Marketing Manager Annaliese Hughes commented, "Having safe, well run, legally compliant venues in Southampton, can only enhance the customer experience. In time this will help increase footfall and sales and reduce alcohol-related crime, which is good for everyone involved." Grand café held it’s very popular Annual Charity Golf Day on Tuesday 4th October at the Meon Valley Hotel and Country Club. Twenty teams teed off at 10am with a ‘shotgun start’ after enjoying a breakfast of superb hand carved bacon rolls and coffee. The now legendary ‘goodie bags’ for every golfer contained a pro tour golf towel and a superb vented golf umbrella plus other various goodies. The weather was set fair for a great day on the excellent Meon Valley Golf Course which was in perfect condition, made all the more enjoyable with the Halfway House dispensing delicious Gentleman Jack Daniels & Ginger Ale cocktails and the golfers could also try a sample range of men’s Clinique skincare products generously supplied by John Lewis of Southampton. Players could also enjoy an ice cold beer on their way round kindly supplied by Carlsberg and dispensed from the drinks trolley by the lovely Marion and Annaliese with various chocolate goodies to keep their strength up. A VW Golf was on offer for a ‘hole in one’ on the daunting 12th over the lake with special prizes on all the other par 3’s generously provided by Peter Cooper Volkswagen & Prestige Cars but sadly there were to be no winners. After a great day on the course the players then tucked in to an excellent late lunch of delicious chilli or curry and rice with tacos or naan bread and poppadoms. All the teams plus other guests then attended the prize giving and fund raising dinner at Grand Café in the evening with a superb 3 course dinner and entertainment from the talented magician Dean Nicholas who performed at the tables and then as a cabaret. There was also a successful raffle, fun game between courses and charity auction with the day raising over £5000 for the Hampshire Region of the Lord’s Taverners who provide at least one specially adapted mini bus for disabled and disadvantaged children all over Hampshire every year. Many of the teams have already booked their places for 2017 when the annual golf day will take place on Tuesday 26th September. 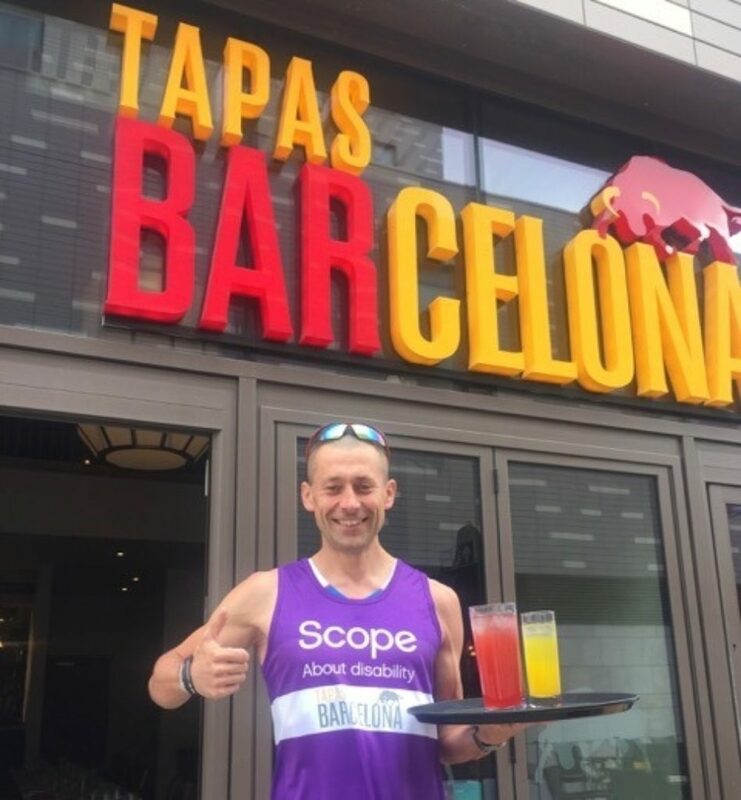 Delicious Dining waiter Roman Janda recently completed the gruelling Iron Man Wales 2016 in aid of the charity Scope. Roman, who works at the group’s Tapas Barcelona restaurant in Guildhall Square, swam 2.4miles in Carmarthen Bay, followed by a 112-mile cycle race through the Pembrokeshire Coast National Park, rounded off with a marathon of 26.2-miles. Finishing the event in 12hrs 7 minutes. Roman first competed in the event in 2014 when he worked at the group’s Cromwell Arms Hotel, since when he has been strongly supported by the Delicious Dining group, helping him to pursue both his passion for fundraising and his determination to compete in one of the country’s toughest Iron Man events. Roman said: ‘Working for Delicious Dining has enabled me to gain both their direct support in my fundraising and give me the flexibility to train and attend these events, without which I doubt I would have been on the start line”. The 38-year trained throughout the year taking part in various competitions including the Southampton Half Marathon in April. On completing the Iron Man he commented: “It was one of the toughest so far, everything went according to plan but in final stages of the run, with only 12 miles to go, the intensity just hit me and I was quite poorly, but I managed to cross the line and finish in the top 100 of my category. Southampton hospitality group Delicious Dining today launched its search for Outstanding Student of the Year at City College Southampton. 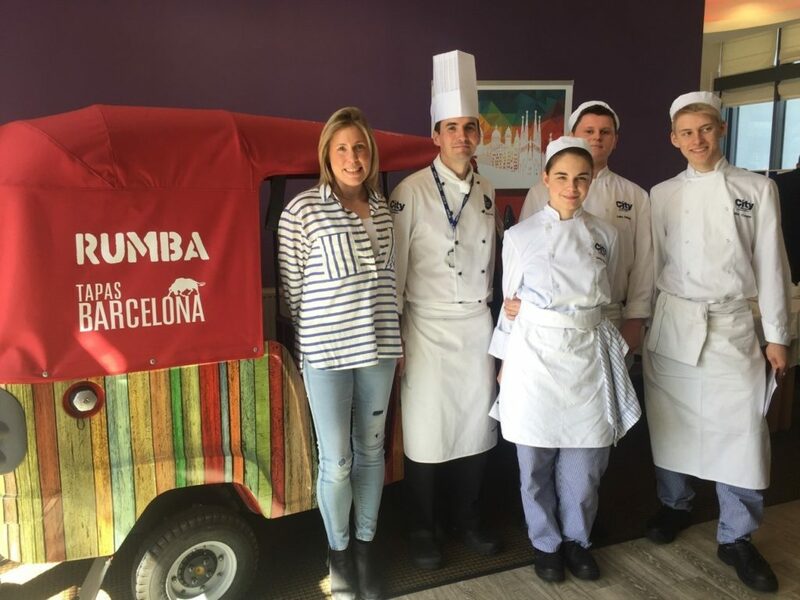 The initiative will provide students from two courses, the Diploma in Professional Cookery and the Diploma in Hospitality Supervision and Leadership, with work experience at the some of the group’s leading city venues and mentoring opportunities throughout their final year at college. Delicious Dining’s management and chefs will work alongside college tutors to identify and shortlist the standout candidates for the award. To qualify, students will need to demonstrate a positive approach to their studies, a good attitude, consistent grades, good attendance and an overall desire to excel. The two winners will land positions with Delicious Dining, the South’s largest independently owned hospitality group. l-r Annaliese Hughes Marketing Manager Delicious Dining, Patrick McLoughlin Hospitality Lecturer City College and City College Students. Delicious Dining, the South’s largest independently run hospitality group, will once again be on hand to refuel and reward Southampton Half Marathon runners. This year, all six of the group’s city restaurants will be offering a 15% discount on all meals for a week starting on race day Sunday 24th April. The restaurants, Shrimp and Burger Bedford Place, Banana Wharf Ocean Village and Hamble, Tapas Barcelona Guildhall Square, Ennio’s Town Quay Road, and Puccini’s Shirley High Street will be offering the discount to every competitor when they dine at the restaurants wearing their medal. Annaliese Hughes, Delicious Dining’s Marketing Manager said, “We are really excited about the ABP Southampton Half Marathon taking place literally right on our doorsteps. Tapas Barcelona is located in the square where all the racers will be finishing while the runners go past the front door of Banana Wharf in Ocean Village. The ABP Southampton Half Marathon and 10km will see 6,000 runners tackle the 13.1mile course around the city. Action gets underway in Hoglands Park and takes in a mix of coastal, urban and green areas including the iconic Itchen Bridge before a grandstand finish in Guildhall Square. Southampton’s popular Italian eatery Ennio’s has been voted one of the best Independent Italian restaurants in the UK. The restaurant faced stiff competition from Italian eateries across the UK and was awarded its prestigious Gold Award on Thursday evening at a gala dinner on London. The accolade was awarded by PAPA, the Pizza, Pasta & Italian Food Association, who identified the restaurant as having authentic Italian food at the heart of its cuisine while serving up a genuine Italian dining experience. The 100-seater ristorante is owned by Southampton-based Delicious Dining and is no stranger to awards; it has been voted Hampshire’s best Italian restaurant, and came 7th in the Bertolli and BBC Good Food national awards. Delicious Dining has appointed José Garcia as the General Manger of its new flagship Southampton eatery Tapas Barcelona. Garcia, who hails from Salamanca, Northern Spain, joins the South’s largest independently owned hospitality group from the White Horse in Romsey. With 25 years industry experience, Garcia brings with him a wealth of management capability and teams up with his former colleague, Tapas Barcelona’s Head Chef, Chris Rock at the all-new 100-cover venue. Garcia said that joining the Delicious Dining Group marked a welcome new direction for him and is looking forward to introducing an authentic taste of Spain to the Southampton market. “Delicious Dining is a progressive group with its own personality and Tapas Barcelona will offer the Southampton diners a fresh new approach to dining out not on offer from the larger brands in the city,” said Garcia. The 5,000 sq. ft. restaurant, which is located in Southampton’s Cultural Quarter, is due to open in November. The million pound restaurant is the group’s largest investment to date. Tapas Time as Southampton’s latest dining experience opens. Delicious Dining has opened the doors to its latest restaurant, Tapas Barcelona in the heart of Southampton this week. Located in the newly developed Cultural Quarter the uniquely styled restaurant offers customers an authentic Spanish dining experience in the heart of the city. Set over two levels, the restaurant comprises a large downstairs bar, dining area with an open kitchen and paella kitchen along with an upstairs Mezzanine lounge bar. With influences from Spanish speaking kitchens from around the world, the menu features many favourites including Iberico ham croquetas, patatas bravas and mouthwatering paella along with a wide range of vegetarian and gluten free options. Overlooking Guildhall Square and flanked by larger national chains Tapas Barcelona is part of the independently owned Delicious Dining group, based in Southampton. The 5,000sqft venue features a traditional design with a twist. Four large back lit wall hangings and lanterns create a welcoming space in the main area with a sweeping wrought-iron staircase to the first floor lounge bar. Downstairs the open kitchen allows diners to experience the energy of a busy restaurant while the back bar provides a more intimate area as diners are transported to the streets of Barcelona as they dine at the foot of Gaudi’s famous Casa Batllo with its skull and bones balconies. Open seven days a week Tapas Barcelona can be contacted on 023 80337171 for bookings. Delicious Dining, the South’s largest independently owned hospitality group, recently launched its new dining App. Moving away from the printed loyalty card the Delicious Dining customers can now enjoy a digital experience from the operator. The App allows the customers to collect points on their smartphones each time they visit one of the groups 12 keys outlets which can then be cashed in for rewards. In addition it allows customers to browse the restaurants’ menus, book a table, locate their nearest Delicious Dining eatery and keep up to date with the latest offers from the group. All data from the App registrations is then added to the group’s existing e-database that currently sits at 12,000 subscribers.